Today we’re talking about why you’ll often see that what top pickleball players DO does not always match what I TEACH in my book, clinics and bootcamps. Prefer to listen? Click here or use the player below. Enrique Ruiz lobs the heck out of his opponents. Jennifer Lucore & Alex Hamner often smack the heck out of the ball instead of playing soft. Morgan Evans often goes for the third shot drive instead of the third shot drop. Matthew Blom hits his serve hard, often going for an ace. If these top pickleball players do so well using these tactics, why is it that I usually recommend that my students do almost the OPPOSITE of these things? To be more detailed about it, you’ve probably watched a lot of top players out there on Youtube or different channels out there, and you noticed that certain number of players do certain number of things which I hardly recommend for most of us. The reason behind it is that most of these players have VERY good consistency in what they hit. They are very, very strong in hitting. A top player who hits a great lob, consistently, sometimes does it with a lot of details to it, and he needs a lot more confidence to it. So something which I normally recommend very little to people about trying to lob, because it’s not the most effective shot, but in particular cases, in his case, I think that is a VERY great shot to have. Sometimes it’s also related to the agility of a player. Most of these top players are young and fast and quick and they can generally get to most of the balls. So that’s a great opportunity for most of these young players to play that way, but most of us are probably not that fast and quick, and don’t have the reflexes. But for the players who want those techniques, and have consistency, I’m happy to teach them. But in most cases, that is not the case. There are also hours and hours of practice that these players have put together. Most of us are recreational players but some of those top players spend many, many hours behind their game, so they are much, much easier and feel very flexible to play a lot of shots, which they have mastered and honed. So those are the three main reasons that top players can get away with breaking the rules. 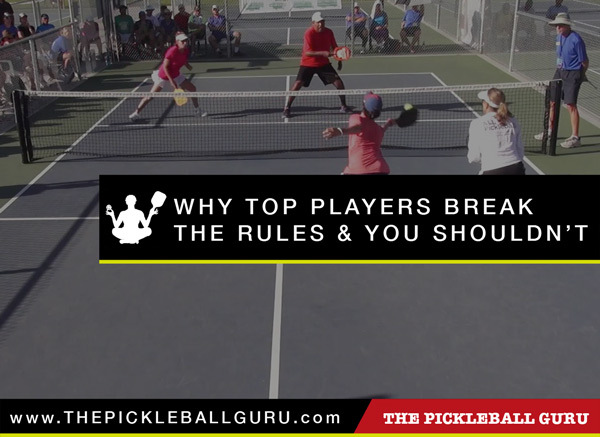 So How Do You Know if You Can Break the Rules Like a Top Pickleball Player? As far as certain shots which I don’t recommend in a normal class, but are out there, it doesn’t mean that you guys are doing something wrong compared to them. They have just spent more time in their game and they are much more consistent. If YOU are confident and consistent with the shot you have, go ahead. Please use it in your game. I’m always a proponent of using whatever works for you in your game. If you like this article, please share it with your friend, subscribe to my youtube channel, or sign up for my free newsletter.